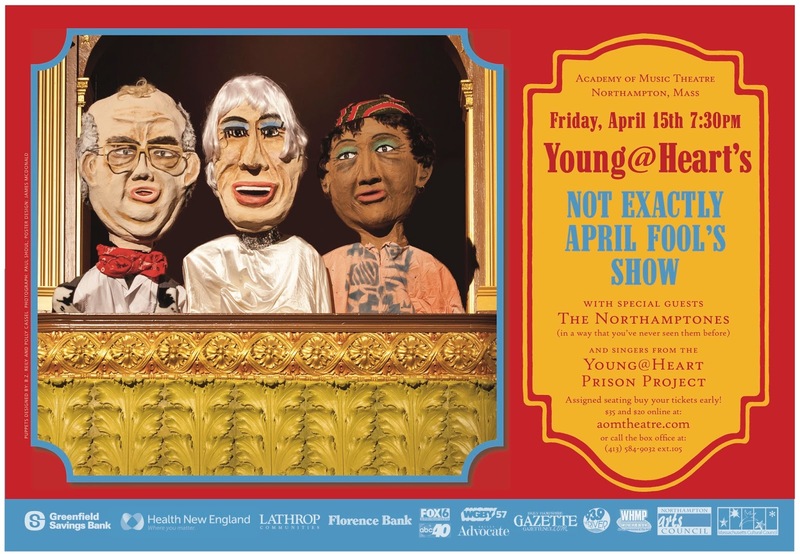 The Young@Heart Chorus presents our 3rd annual (Not Exactly) April Fools Show at the Academy of Music Theatre in Northampton on Friday April 15 at 7:30PM. This concert will also feature the much beloved Northamptones, a cappella group from Northampton High School, in a way that you've never seen them before. Tickets for the show can be purchased online at aomtheatre.com or at the Academy Box Office 584-9032 ext. 105. This year, for the first time ever, there is assigned seating and tickets range from $20-$35. Young@Heart - What started out in 1982 at a Western Massachusetts elderly housing project to joyfully pass the time instead of passing before your time has developed into the stereotype-defying, genre-bending, generation-crossing musical extravaganza better known as the Young@Heart Chorus. From The New York Times to TIME, The Tonight Show to The Daily Show and stars of the hit indie documentary, Young@Heart, this group of seniors, ranging in age from 73-92, has toured from Northampton to New Zealand, Europe to Japan, proving it’s “possible to grow old without growing boring” (The Dartmouth). Young@Heart Prison Project - In October 2014, we launched the Young@Heart Prison Project making music with inmates in weekly rehearsals and semi-annual concerts at both the Northampton men’s prison and the Chicopee women’s prison. The results have been inspiring. The Northamptones - The Northamptones is Northampton High School's advanced choral group. The group is audition based, and meets every other day for an 85 minute school period. Currently, there are 12 people in the group. Sponsored by Greenfield Savings Bank, Health New England, Lathrop Communities, Florence Bank, 93.9 The River/WHMP, ABC40/FOX6, WGBY57, Daily Hampshire Gazette, Valley Advocate, Northampton Arts Council, and the Massachusetts Cultural Council.